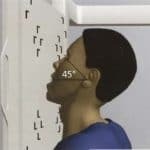 This article discusses radiographic positioning of the face and mandible for the Radiologic Technologist (X-Ray Tech). The skull consists of 8 cranial bones and 14 facial bones. 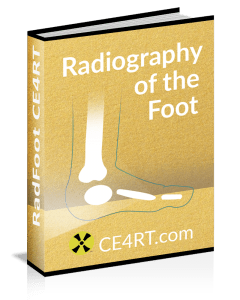 We have a separate article on radiographic positioning of the skull. 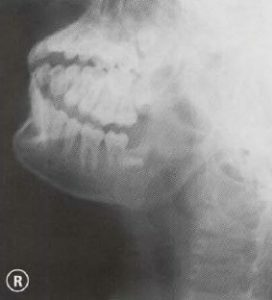 A properly positioned radiograph of the face and mandible shows the relationship between the bony structures and soft tissues of the visualized anatomy. 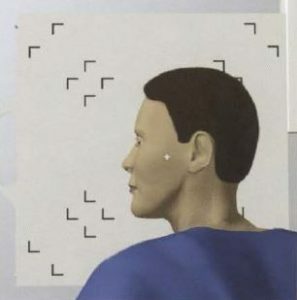 Below we describe the major projections used in imaging the face and mandible. Purpose and Structures Shown To evaluate the sinuses. Position of patient Sitting erect. This view is used when only one view of the sinuses is requested. This view is unreliable to demonstrate sinus infection in children under the age of 7. For patients who cannot sit, the semiaxial skull (Towne method) should be used. Position of part Remove dentures, hair grips, earclips, and anything from the hair. The patient should be asked to open the mouth as wide as possible with the chin resting against the cassette holder. 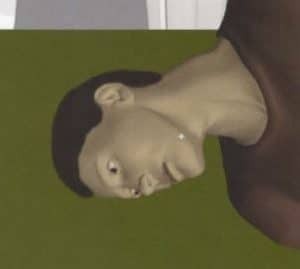 The head should be tilted back 45 degrees. Purpose and Structures Shown To evaluate the orbits, maxillae, and zygomatic arches. Position of patient Sitting upright or prone. The midsagittal plane is centered to the midline of the grid. The arms are in a comfortable position with the shoulders flat and in the same horizontal plane. Position of part Remove dentures, hair grips, earclips, and anything from the hair. 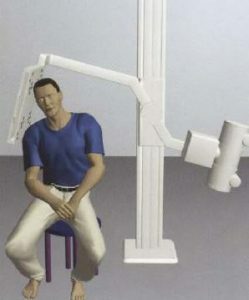 In the sitting erect position, the tip of the extended chin rests against the IR. The neck is extended such that the orbitomeatal line forms a 37-degree angle with the IR. The mentomeatal line is perpendicular to the IR. The central ray is perpendicular and exits at the acanthion. The head is immobilized. The patient should be asked to suspend respiration for the exposure. 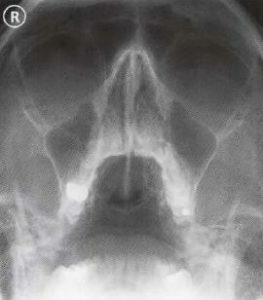 A properly positioned radiograph of the facial bones with Waters method demonstrates equal distance between the lateral margin of the skull and the orbit on both sides. The petrous ridges are seen projecting immediately inferior to the maxillae. 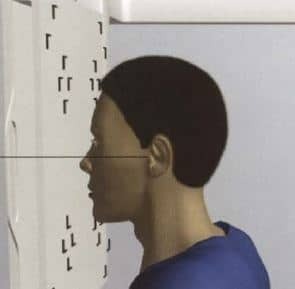 Purpose and Structures Shown An additional view to evaluate the face and ethmoidal, sphenoidal, and maxillary sinuses. Position of patient Sitting erect. If only one view of the sinuses is requested, use sinuses and face semiaxial. The midsagittal plane is centered to the midline of the grid. The arms are in a comfortable position and the shoulders are in the same horizontal plane. Position of part Remove dentures, hair grips, earclips, and anything from the hair. The line from the lower bony edge of the orbit and the opening of the ear should be perpendicular to the cassette holder. 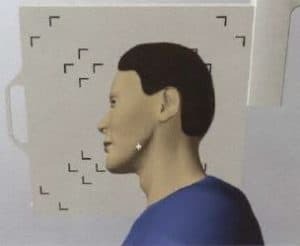 Center between the eyes corresponding to the root of the nose. The neck is flexed such that the orbitomeatal line is perpendicular to the IR. The head is immobilized. The patient is asked to suspend respiration during exposure. 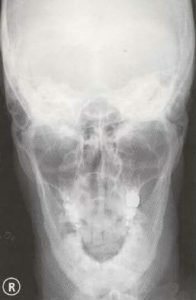 A properly positioned radiograph shows equal distance between the lateral skull margin and the median sagittal plane on either side as well as symmetric petrous ridges. 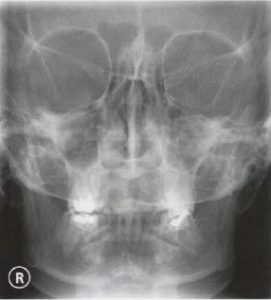 Purpose and Structures Shown An additional view to evaluate the sinuses, face, and nasal bones. Position of patient Sitting erect. This view is not used in children under the age of 7 unless there is trauma or suspected tumor. For patients who cannot sit, the skull lateral supine with horizontal beam should be obtained. Position of part Remove dentures, hair grips, earclips, and anything from the hair. The right side of the head is placed next to the IR. The midsagittal plane of the head is parallel to the IR. The interpupillary line is at a right angle to the IR. The neck is flexed such that the infraorbitomeatal line is parallel to the transverse plane of the IR. The patient should be asked to suspend respiration during exposure. Purpose and Structures Shown Henschen (15-degree), Schuller (25-degree) and Lysholm (35-degree) methods to demonstrate the mastoid cells, mastoid antrum, internal and external auditory meatuses, and tegmen tympani. 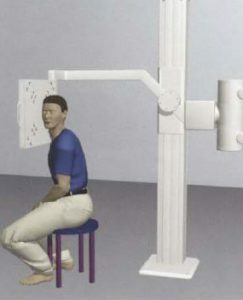 Position of patient Sitting erect before a vertical grid device. The central ray is directed through the external auditory meatus at a caudal angle of 15 degrees (Henschen method), 25 degrees (Schuller method), or 35 degrees (Lysholm method). Position of part Remove dentures, hair grips, earclips, and anything from the hair. 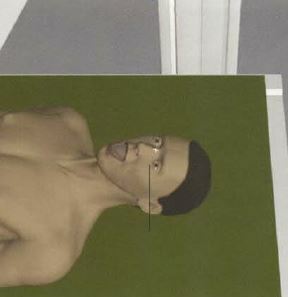 The patient’s head is in a true lateral position. The midsagittal plane is parallel to the IR. The interpupillary line is perpendicular to the IR. The neck is flexed such that the infraorbitomeatal line is parallel to the transverse axis of the IR. The head is immobilized. The patient should be asked to suspend respiration during exposure. In a properly positioned radiograph, the mastoid and petrous regions are visualized in the center of the film. The mastoid air cells are posterior and the TMJ is anterior to the petrous region. 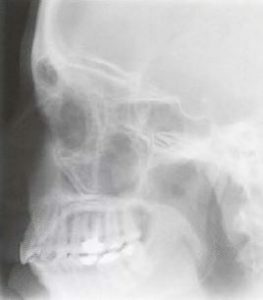 Due to the increasing angulation of the central ray, the mastoid and petrous region on the opposite side do not superimpose. Purpose and Structures Shown To evaluate the mandible. Position of patient Sitting erect. Position of part Remove dentures, hair grips, earclips, and anything from the hair. 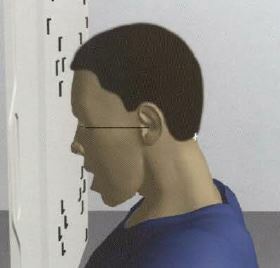 The patient should be asked to open the mouth as wide as possible with the nose and forehead resting against the cassette holder. The line from the outer corner of the eye to the opening of the ear should be perpendicular to the cassette holder. Purpose and Structures Shown A basic view to evaluate the mandible. 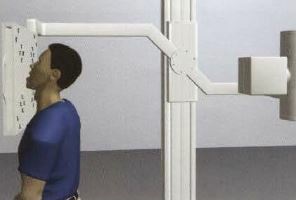 Position of patient Sitting erect (left or right) with the horizontal beam angled at 15 degrees. Position of part Remove dentures, hair grips, earclips, and anything from the hair. 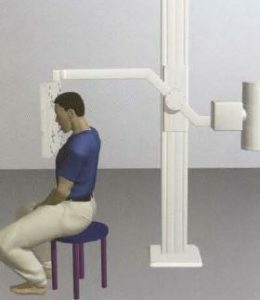 The patient should be asked to sit with the side to be imaged nearest to the cassette holder. 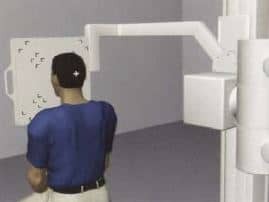 The X-ray tube should be angled 15 degrees. The head should be tilted inwards by 15 degrees so that the head and shoulders rest against the cassette holder. Purpose and Structures Shown An additional view to evaluate the mandible. 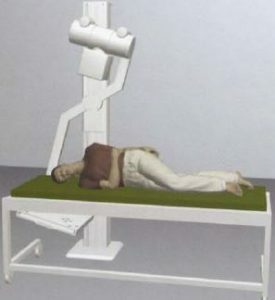 Position of patient Supine with a vertical beam angled at 30 degrees. Position of part Remove dentures, hair grips, earclips, and anything from the hair. The patient should be asked to open the mouth as wide as possible. A wedge of cork or soft wood may be placed between the upper and lower rows of teeth if the patient cannot keep the mouth open. The line from the lower bony edge of the orbit to the opening of the ear should be perpendicular to the examination table. 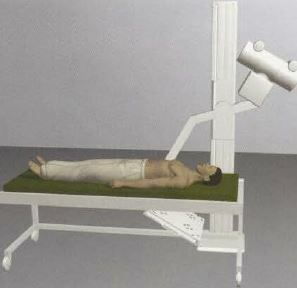 Position of patient Lying on the side (left or right) with a vertical beam angled at 15 degrees. Position of part Remove dentures, hair grips, earclips, and anything from the hair. The X-ray tube should be angled 15 degrees. The side to the imaged should be positioned nearest to the table. The patient’s head should be tilted by 15 degrees. Purpose and Structures Shown To evaluate the body of the mandible and dental arch. Position of patient Supine with the neck fully extended. The thorax is elevated on a firm pillow. The knees are flexed. 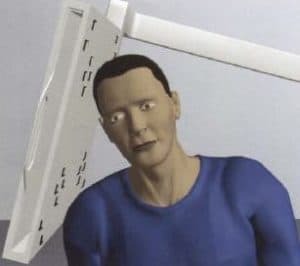 The arms are in a comfortable position. Position of part Remove dentures, hair grips, earclips, and anything from the hair. The neck is fully flexed such that the midsagittal plane is vertical. The head is immobilized. The patient should be asked to suspend respiration for the exposure. The film packet is inserted into the mouth with the long axis directed transversely and the centered to the midsagittal plane. The central ray is directed perpendicular to the film packet. 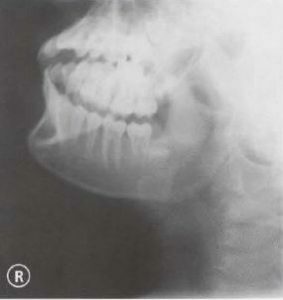 A properly positioned radiograph demonstrates the lower dental arch and floor of the mouth. The entire mandibular body and lower teeth should be visualized. The distance between the outer margin of the mandible and the teeth should be symmetric on either side. Purpose and Structures Shown To demonstrate the mandible as seen from above. Position of patient Prone or seated upright with the chin on the cassette holder. The arms are in a comfortable position with the shoulders in the same transverse plane. Position of part Remove dentures, hair grips, earclips, and anything from the hair. A sandbag is placed under the cassette. The midsagittal plane of the head is centered to the midline of the cassette. The transverse plane of the cassette is directly below the external auditory meatuses. The neck is fully extended and the chin is placed on the cassette. The infraorbital line is parallel to the film. The head is immobilized. The gonads are shielded. The patient should be asked to suspend respiration during exposure. 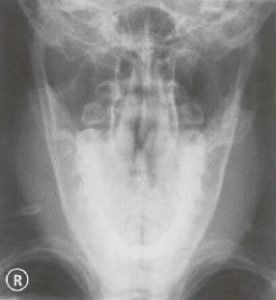 A properly positioned radiograph demonstrates equal distance between the mandible and lateral skull border on either side. The angles of the mandible are anterior to the petrosae.